Approximately one year ago, Bank of America's foreclosure mill sent to me a copy of an altered promissory note, specifically including a robo signed endorsement to Countrywide. This was sent to me in response to a QWR. That is all the information BOA would provide to me. In response to another QWR, the same foreclosure mill again sent a copy of my promissory note. This time the promissory note includes a rubber stamped endorsement by Laurie Meder as Senior Vice President of Countrywide Bank, N.S. and an endorsement in blank by Michele Sjolander, as Executive VP of Countrywide. The latter appeared within the last year from Countrywide, that has been out of business since 2008. It is an obvious cut and paste job, and so far I've matched mine identically (even the stamp smude prints), up with five other people around the country; who have also discovered these new "cut and paste" endorsements on their promissory notes. If anyone is with Bank of America, it might be a good idea to do another QWR; as I believe you will also see the new, magically appearing endorsements. If anyone on this forum, or elsewhere has experienced the same; please e mail me and we can exchange copies and affidavits. I work with people facing foreclosure. As the first response to a QWR sent to BOA, we received a copy of a Note with no endorsements. This recent response after letting them know that could not be the case; we received a copy of the Note with 2 endorsements stamped on the side of the closing signatures (should have been placed on an allonge to the note). 2.) Pay to the Order of "blank" Without recourse Countywide Home Loans, Inc by Michele Sjolander Executive Vice President. --we did get an assignment where MERS signed to BAC Home Loans in 2011. As long as MERS is on the security instrument (Deed of Trust) this is legit and there would not be major issues besides the assignment was executed years after BOA starting taking payment; but the major problem is BOA is presently the servicer and not the owner so who did they endorse to? Why is that not on the Note? Where is the assignment? ASK QUESTIONS PEOPLE. MORTGAGE FRAUD IS REAL!!! This new photo shop Sjolander and Meder endorsements appeared within the last year and Countrywide has been out of business since 2008; so in my view it shows criminal intent to defraud. Also, the first Allonge sent to me by BOA was a completed page with the DocMagic line across the bottom and form number, form edition, etc. They took that and copied the 8 1/2 x 11 sheet onto a legal sheet and placed the fraudulent Meder/Sjolander stamp below the DocMagic line connoting the end of the page. Has anyone found a person or company that can verify in writing that a document has been manufactured? Thanks for the link Unregistered. Another person with the identical endorsement contacted the court reporter for a true and accurate copy of the deposition, and was told the Bank had to approve their request first. WTH? If a person want to use a document i.e news article, briefs, study, research as an evidence in the lawsuit, a Request for Judicial Notice can be filed . Here, we also have another post from disgusting SPAM bit©h Anh who is committed to destruction of the Forum by her posts of dubious and legally incorrect information and celebration of incompetent lawyers. Anh = Ann = Unregistered. DISREGARD ANY POSTS BY THIS HORRID WOMAN! No, this post by Anh is NOT helpful. Instead it is incomplete, deceptive and misleading as with essentially ALL of the posts by this SPAM bit©h. Mr. Roper has previously posted some information about judicial notice which is actually helpful. I am pressed for time tonight, but will find those posts and will elaborate in another post to follow. Without a better understanding of hearsay, personal knowledge and the role of judicial notice, what Anh advocates is simply more useless garbage. All Forum participants need to understand and appreciate that Anh is never trying to HELP YOU by her incessant posts. Rather, she is seeking to help the unethical lawyers she celebrates. BEWARE OF EVERY POST BY THIS DESPICABLE WOMAN! t: "Mr. Roper has previously posted some information about judicial notice which is actually helpful." Note: "show results as" use option "posts". also, T's recommendation re the "MOST DESPICABLE WOMAN" (well that is a suspect suggestion that Ann = Anh = unregistered) is actually human - should be followed. Thanks guys. I will search the forum. I have a Laurie Meder signature for Countrywide and two other endorsements from Michele Taylor, Allied, Jeanne Stell. Laurie Meder the Allonge is upside down, the claim of Kerry Duffy, attorney for Mellon, Countrywide had standards for approving loans, that all documents have been with Mellon since it went into the trust, then why did Allied do an assignment of mortgage in December 2009, when my loan went in by Dec. 2006. Looking over my documents they are all connected in this fraud. If they are so together and their ducks are swimming in a row, then why is the one upside down, bad lining up, why all the endorsements??? Why do another assignment after they Mellon file the lawsuit to take my house. The ex-lawyer idiot missed this, so simple to see, I could have pointed this out in a new york minute. No instead he believed Mellon, the mortgage guy, and didn't do what I paid him for, wow, he lost me my home... and the judge did also, with that 44 page document he wrote on June 20 for June 22 Summary Judgment hearing. I also have a Laurie Meder endorsed note. Endorsements suddenly appeared on the note this year (2012). I wonder if we compared her signature if it would match or be totally different? Other robo signers have been found to have a number of very different signatures that could not have been signed by the same individual. Fraud and more fraud, but just like Coastie, our attorney does nothing and doesn't want to listen or see the truth staring him right in the face. I will give you the name of them when you e-mail me. I also found out some other important information which hope will help our case. I am fighting the machine that is trying to take my home and will not give up. If the other group you mentioned is so great - why not just post the information right here ? Of course, you know the answer is that this is simply another of the scams! I had 4 original notes with Sjolander's stamped indorsemented examined by an expert. He opined that the stamp was not done with real ink and that the indorsement was a "xerox forgery." A motion for fraud on the court is pending in my 4 cases in Miami-Dade County. No repsonse has been received by BAC as of this date. Mark, I have several copies of the Sjolander/Meder signature stamp. I took all of them to a handwriting expert who said four were EXACT matches, which of course is impossible. Another matter to be explored is the foreclosure affidavit itself. In our N.C. cases, the foreclosure mill presented an affidavit at the foreclosure "hearing" (laughable since Clerk of Court with no legal experience refuses to look at any evidence presented by the victim). The Affidavit is prepared on a blank sheet of paper, purported to be prepared by a VP of Bank of America, N.A. with no letterhead of the Bank's, no return address, no telephone number, etc. In other words, no way to cross examine the person who purportedly executed the affidavit. "Financial Instruments; Financial Instrument Leasing; Bank Debt Instruments; Balance Sheet Enhancement; Credit Enhancement; Collateral Infusion; Secondary Collateral"
So Bank of America and its' cohorts are now outsourcing the robo-signing. There is nothing whatsoever that is new about outsourcing of the robo-signing. Mr. Roper and others here at the Forum were showing robo-signing outsourcing as early as 2006. In fact, most robo-signing was originally outsourced to Fidelity National / FIS Foreclosure Solutions prior to the implosions of the In Re Hill and In Re Wilson cases. This is why Mr. Roper posted extensively about those cases. It was only after LPS got caught with its hand in the cookie jar in In Re Wilson that most robo-signing activity was shift back to the servicers! It was during this era that robo-signing that had previously been done in Dakota County, Minnesota, and Duval County, Florida, began to be also shifted to new contract forgers and perjurers, such as the LPS DOCX subsidiary in Alpharetta, Georgia. DOCX was simply continuing (mostly in respect of assignments) the very same activity that had been done by LPS employees directly prior to In Re WIlson. This is all very well documented. While it seems that you have uncovered another contract perjurer previously unknown to me, this is precisely the sort of behavior that Nye Lavalle, Mr. Roper and otehrs identified years ago. Search through the older posts, at least the ones that the site administrator hasn't yet deleted, to better understand these dimensions of the problem. Well, what's interesting to ME is that this is STILL going on. When BofA came back after me essentially for a "third bite at the apple" last month (after two prior voluntary dismissals), I presumed that at least THIS time, they had their paperwork (mortgage assignment, Note allonge, etc.) properly buttoned up. Now I see upon reading this that I have the same "Laurie Meder/Michele Sjolander" blank stamp on my Allonge. 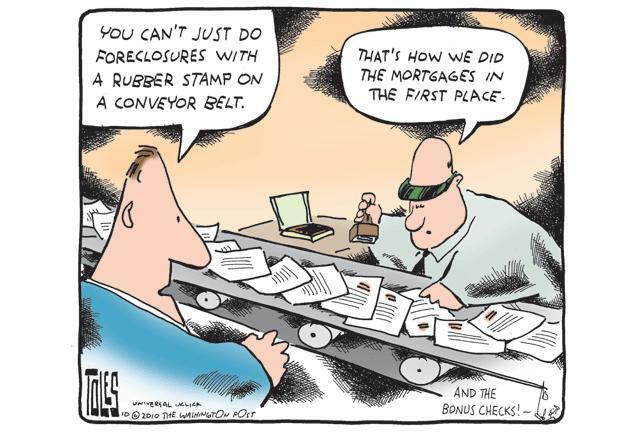 I'm going to provide this to my foreclosure defense attorney -- thanks for sharing! Erla Carter Shaw is another EVP whose alleged signature was stamped on the notes of TBW borrowers. This report was submitted to the IL Supreme Court, Committee on Foreclosures. It is very important to distinguish the real issues from the the chaff. There is so much misinformation floating around out there that this can be very challenging! So what would make a Countrywide indorsement invalid is NOT that it contained rubber stamped signatures of Laurie MEDER and Michele SJOLANDER, but rather that the indorsements might have been added later and forged by someone other than Countrywide. This presents a rather daunting proof problem. That having been said, very often the best defensive proof as to mischief is the prior pleading by the Lender of an unindorsed copy. Mr. Roper discussed this in several posts, including the exceptionally important post on judicial admissions by attachment of an exhibit to a complaint (which post was removed by the site administrator). One clue to possible mischief is use of allonges at all. Most indorsements appear on the original instruments. Contrary to what seems to be shown in court records, where allonges seem to be used extensively, the real indorsement is usually on the note. But the fact that the Lender has often forged an allonge does not mean that the original note was unindorsed. This is another lesson that Mr. Roper has taught us. The original note is usually sitting in the vaults of the institutional custodian with a proper indorsement in blank. But the foreclosure mills most often initiated foreclosure using an unindorsed copy of the note obtained from the servicer's digital archives without going to get a copy of the indorsed original. After pleading the unindrosed copy, the foreclosure mills often covered up their mischief by forging an allonge. This creates a further defensive muddle for the borrower, because the best proof that the allonge is a forgery is to force the production of the original note. The original will then be shown to have another different indorsement on it. In years past, when caught in their lies, the foreclosure mills and servicer would sometimes then even forge another "original" note, WITHOUT an indorsement. That is the borrower's name would be forger on another document so that the servicer had an unindorsed note to go with the allonge. The document will be filed with something like a "Notice of Filing of Allonge" or "Notice of Filing of Assignment", rather than being attached to an authenticating affidavit. It is imperative to use discovery to get the plaintiff to TAKE A POSITION UNDER OATH as to the authenticity of the allonge or note. Only after someone has SWORN TO THE AUTHENTICITY do you want to embark upon a concerted attack on the forgery. Bear in mind that in producing the real original, the plaintiff will usually have all the proof it needs of valid indorsement. The forged allonge and even the forged original of the note will be both anomalous and unnecessary. If the plaintiff has put this garbage into evidence without any authenticating affidavit, the borrower is only going to have traction in the courtroom of a judicial activist like Justice Shack (in Kings County, NY). By contrast, if you have gotten the Lender and the foreclosure mill attorneys to swear to these false documents and then show the forgery, you can achieve a very nice settlement upon proof of the forgery. Mr. Roper has explained all of this in previous posts. Very helpful -- thank you! It is included here as an attachment to the Note that my wife and I orginally signed when we refinanced the mortgage. But I've already caught them back-dating the Mortgage assignment and then filing it with our County's clerk of the courts, as well as them supposedly assigning it to a trust that was long-since dormant (and unable to accept new mortgages to its bundle as per its Pooling agreement). They have no rules or posts for what happened to me, LOL. When I started researching our loan I found that our new financed loan (new as in 2006) was never perfected. Why because the old loan with Countrywide was still showing as active with Fannie Mae as investor. So we have two notes on our property with one that should have been paid off by the new lender, TBW but it either wasn't or Countrywide multiple pledged the note and only released one of them. As a NY Times article says the practice was industrywide. By the way Freddie Mac was the investor in the other loan. The Feds didn't like that too much when I showed them what I had. Matter of fact they filed a about 20 lawsuits shortly thereafter, he, he. I'm giving everything I find and telling everyone I know. Finally this stuff is getting to the mainstream. Never give up. Keep exposing all you find. The impulse amongst pro se litigants is to want to run into court to show the Judge each new outrage by the plaintiffs. This is usually not a very good strategy. A more sophisticated strategy is to say as little as you possibly can, consistent with pleading rule requiring specificity, and then to give the plaintiff as much latitude as possible (again consistent with the need to avoid summary judgment, etc.) to present its various fraudulent evidence to the court. You need to first challenge on authentication to force them to prove up their forgeries before exposing the forgeries! Also, bear in mind that in routine cases, the plaintiff is being paid a fixed price by the servicer to litigate the foreclosure and is going to devote minimal time and resources to the case. As you draw out your defense, the case may also get passed from lawyer to lawyer and even from firm to firm. Each lawyer and each firm will give the file only a quick, cursory read and none of these will ever be as familiar with the case as you are. Also, as the case passes from one firm to another, they will lose track of what is real and what was forged. You need to use this inherent confusion against them! Why the condescending remarks? Why do you do this? It's very abusive. Perhaps you are a lawyer and know what you are talking about but as soon as you start the name calling and condescension your posts become irrelevant, no one will listen to you. I hope the administrator of this forum will warn you to stop making condescending remarks and to stop the name calling. If you don't want to be here just leave otherwise keep your tone civil and participant like a human being that cares. f is one of the very smartest of the Forum's remaining seniors. He has every right to be condescending when an idiot such as yourself shows up and begins to pontificate about things you know absolutely nothing about. Here's some information you might find useful. I believe the reason that it is important is because the employees whose signature was stamped never supervised or even in this case (BofA) was allowed in the stamping room. If someone is using your signature on a stamp that is a problem if you have no knowledge of the process. I'm not saying you have a win but I would definately look into it. In our case there was more than meets the eye. For one Erla Carter Shaw's stamped signature doesn't appear to match her original signature. And she supposedly supervised up to 565 employees so she couldn't have supervised the stamping of her name on that many notes. Here signature was also being used post TBW bankruptcy petition date. We got very lucky and found even more, much much more. Sharon posts a link to another scam foreclosure defense website, claiming that someone might find this "useful". That Sharon is unable to distinguish between real and useful information and that which is specious and useless makes ALL of Sharon's posts worse than useless. She is not a contributor to the Forum. Instead, she treats the Forum as her personal litter box. I have the Meder/Sjolander double rubber-stamp indorsement too. I read the Sjolander depositions and found the Ice Legal deposition very helpful. Sjolander claimed that SHE gave authorization to use her stamped signature, but stated that she gave POA to ReconTrust. The PoA is not really the issue if the loan was a FNMA loan. Sjolander testified that part of her job was to ensure that FNMA guidelines were STRICTLY followed. I have FNMA publications that say all intervening indorsements must be ORIGINAL signatures. However, in some cases, for the last indorsement in blank, a facsimile might be allowed. "Generally" that signature must be original too, but in the case where a facsimile signature is allowed, the document custodian must get a copy of the corporate resolution that authorized the party whose signature and name is stamped to transfer OWNERSHIP of notes to another party. The FNMA document states that if the intervening indorsements are not original signatures, the loan fails certification for transfer to FNMA. Sjolander testified that she had never personally indorsed a single note, by stamp or by pen in hand, and she does not know who stamped the notes or when they were stamped with her signature. The other issue with the stamped indorsements is Meder and Sjolander signatures are on the same stamp and they are usually undated. Multiple stamps were floating around, and some of them showed Meder as SVP for Countrywide Bank, NA and others showed her as SVP of Countrywide Bank, FSB. In my case, the two ladies were EVP and SVP at the same time only in 2008, but my loan closed in 2007. None of this was ever supposed to see the light of day, but it did. Ms. Sjolander testified that her signature is not being used anymore. She's a young woman, but she had a heart attack and she said since no one knew when she could return to work, someone decided they needed to discontinue her stamp (as if they cared whether she was at work before the heart attack--they wouldn't even give her security clearance in the room where her stamp was being used! Or so she said). I would have a heart attack too, if I thought my signature stamp was slapped on a hundred thousand or so six-figure notes that didn't meet FNMA guidelines and I had approved them to be placed in the FNMA vault. Here's the part to remember: UCC allows stamped indorsements and dates are not required, and even an unauthorized signature can be ratified if the owner of the note wants to accept the signature. But FNMA forced BoA to buy back many of the faulty CW loans, so it would be extremely unlikely that FNMA would help BoA by ratifying a stamped signature that its guidelines prohibited, and the defect is usually found because the loan is already in default. Yes, siree, I'd have a heart attack too! Keep in mind that all signatures and indorsements are deemed authentic and authorized if the defendant in foreclosure does not contest their authorization and authenticity. The UCC allows ways around both, but the courts usually won't ignore contested material evidence. But the defendant must give a short but plausible reason for contesting. FNMA guidelines was enough in my case to make the Court tell the plaintiff's lawyer that he would need to prove up the authority and authenticity of the indorsements. The lawyer said he did not know how he would do it, but he would do it somehow. I guess he'll be looking for a good robo-signer, or LPS'or Docx' brother. As anyone could tell, I am not a lawyer, I'm just a staunch and opinionated enemy of the fraud that wrecked homes and lives. FNMA guidelines was enough in my case to make the Court tell the plaintiff's lawyer that he would need to prove up the authority and authenticity of the indorsements. The lawyer said he did not know how he would do it, but he would do it somehow. I guess he'll be looking for a good robo-signer, or LPS'or Docx' brother. Kudos on a thoughtful, well reasoned post. God's honest truth is that most of the original Countrywide notes had correct and proper indorsements in place all along. But prior to the robo-signing meltdown, it was quite common for the foreclosure mills to initially plead an unindorsed copy of the note. This was more than enough to get over on the vast majority of court, especially in respect of default judgments. In the handful of contested cases, if the lack of indorsement was noticed by the defendant or defendant's counsel, what the foreclosure mills or Countrywide/BAC would routinely do is forge an allonge containing these notorious indorsements. While it seems inconceivable that these forgeries were being perpetrated as a matter of speed and convenience, rather than out of necessity, this is precisely what was going on, as Mr. Roper suggested in a number of his early posts. This can be proven in respect of newly available evidence. The forged allonges seemed to match and correspond to the unindorsed copy of the note, so this tended to be a quick and convenient way for the foreclosure mills to prevail, based upon forged evidence, without ever taking the note from the vaults (or having to explain that the copy of the note wasn't really a genuine copy after all). When an occasional defendant pressed for the production of the original note, this presented yet another challenge. The original, after all, had different additional indorsements, calling into question the validity of the forged allonge. In these cases, the foreclosure mill or Countrywide/BAC would simply forge a new "original" note complete with the borrower's forged signature. As I stated in my post, I am not pro se -- I have a foreclosure defense attorney. I was wondering if it made any sense to discuss this with him, as he of course will be charging me by the hour for such advice. I wouldn't pay an attorney by the hour to discuss anything posted by Mike H., Sharon or any of these other wingnuts. You would be just as well of paying your lawyer to discuss their theories about UFOs and what happens in Roswell, NM, in Area 51. Perhaps a better analogy is that presenting Mike H.'s or Sharon's arguments or ideas to your attorney is about the same as pouring raw sewage on your attorney's desk and asking for his opinion. In fact, you might be showing your attorney greater respect by simply defecating on his desk and then asking his legal opinion of your contribution to the case, letting him know that you found something similar here at the Forum! By contrast, if you see something posted by Mr. Roper or by Bill, t, Moose or a handful of others, print it out and show it to your lawyer. He might thank you for it and find it useful not only in your case, but also in other foreclosure cases he is litigating. f's posts are pretty good too and should be treated as trustworthy and useful. Also trustworthy are posts from ...., Boyd, Chuck, Floyd, John Lewis, ka and Walt.